If all roads lead to Rome, then no wonder Eataly is busier than ever. In the past four years this mecca of all things delicious has pumped, poured, expressed and served a relentless crowd of visitors and locals. The restaurants are always full, people with overflowing shopping baskets linger over cheese and crusty bread, freshly inked pasta rivals the butcher’s osso bucco for freshness, and the rotisserie, despite sizzling fillets of beef and pork, still sees 250 whole chickens fly out the door every day. 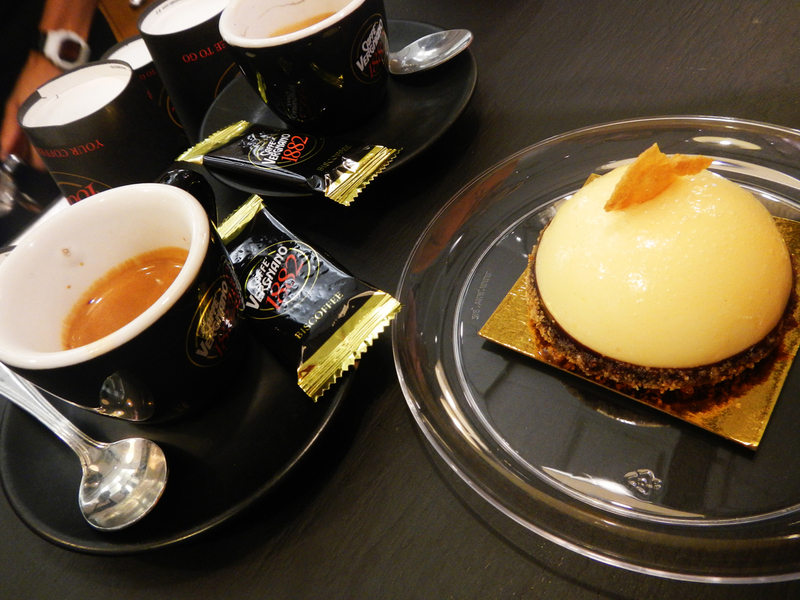 It is impossible to get a coffee from the perpetually queued cafe at the front ( service is a little lento ) but fortunately there is an exclusive expresso bar that serves a serious brew next to the torta temptations. In our case it was limone mousse cake. Last week when I introduced my Australian cousins to this continental extravaganza, the patriarch of Little Collins was there doing the same. It was a tough choice at La Piazza, but in the end we went with the Grand Piatto Misto di Salumi & Formaggio served with paper parcels of bread. The prosciutto and ripe cheese were delicious but the pairing of almond honey with fresh ricotta was sublime. The evening of shared memories and the creating of new ones was fun. I do like to show off the best of New York. But one of the best of Italy also gave us her blessing. 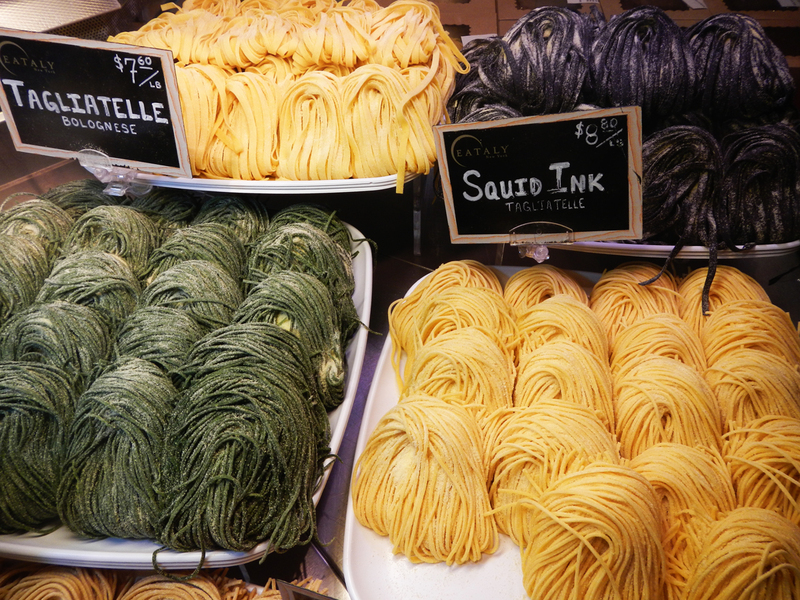 Since that night I have bought a healthy supply of fresh pasta without any guilt. Despite my many indulgences, if it worked for Sophia Loren, it may still work for me…. 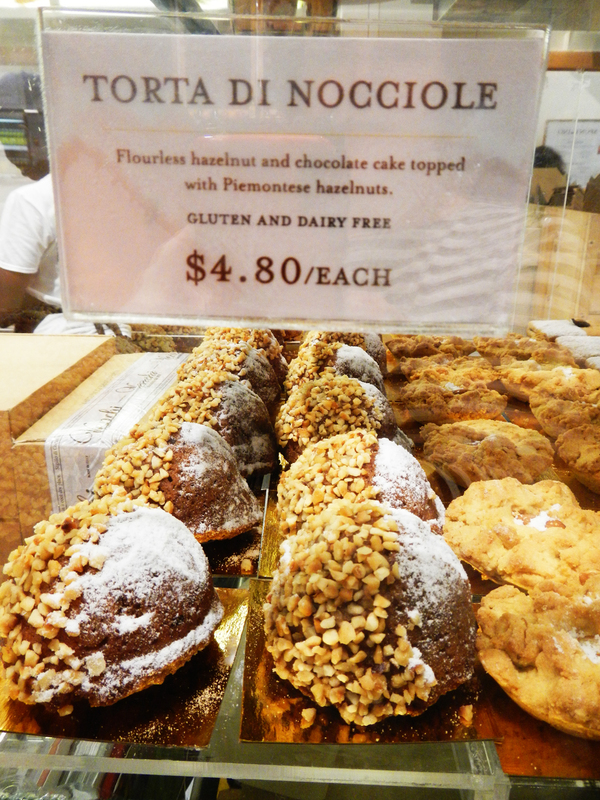 This entry was posted in coffee, Food, Uncategorized and tagged Eataly. Bookmark the permalink. I need to have lunch after reading and viewing such delicious looking food! 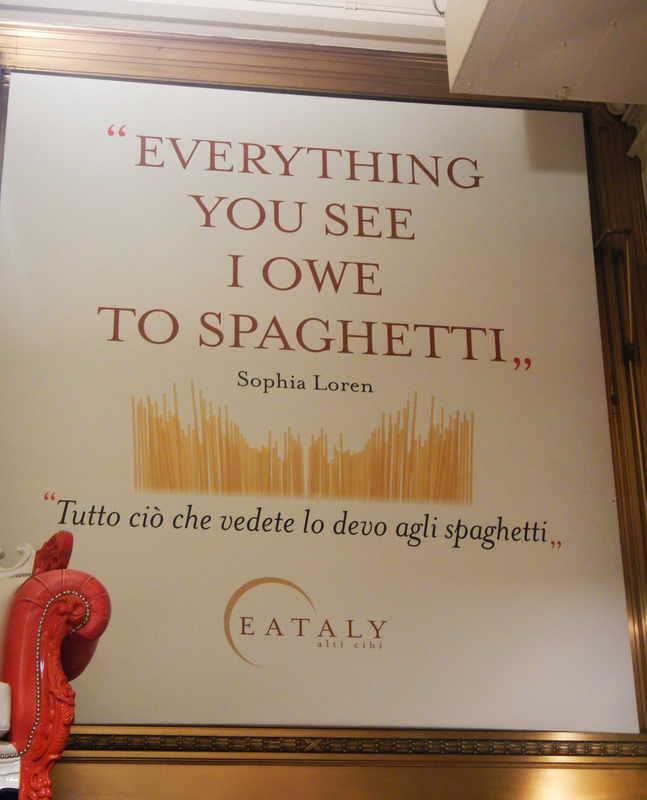 What a great name Eatarly….Shame I am not over there…but thanks to you Gabrielle, I will spread the word to future visitors to New York..
We are in NY at the moment and couldn’t believe our luck when we stumbled into EATALY!!! Just had to have a beer in Birrera, the ‘secret’ beer garden and restaurant on the 14th floor. Good for you! I haven’t got to the secret beer garden yet but sounds fab. Hope you are having a fantastic time – FYI – and you may be way ahead of me, but the new and final section of the High Line just opened and is definitely worth a look. Plus the LED Solar Reserve at the Lincoln Center put on by the Public Art Fund ( the creative director is an Australian ) – let me know! Hi Gabrielle! You wouldn’t believe it. I was in EATALY, checking my emails when the Fitzy report came up!!! Wow! We were eating the mixed salami and cheese platter in the piazza, along with a glass of wine. I was waiting for the cooking class on cucina povera to begin! 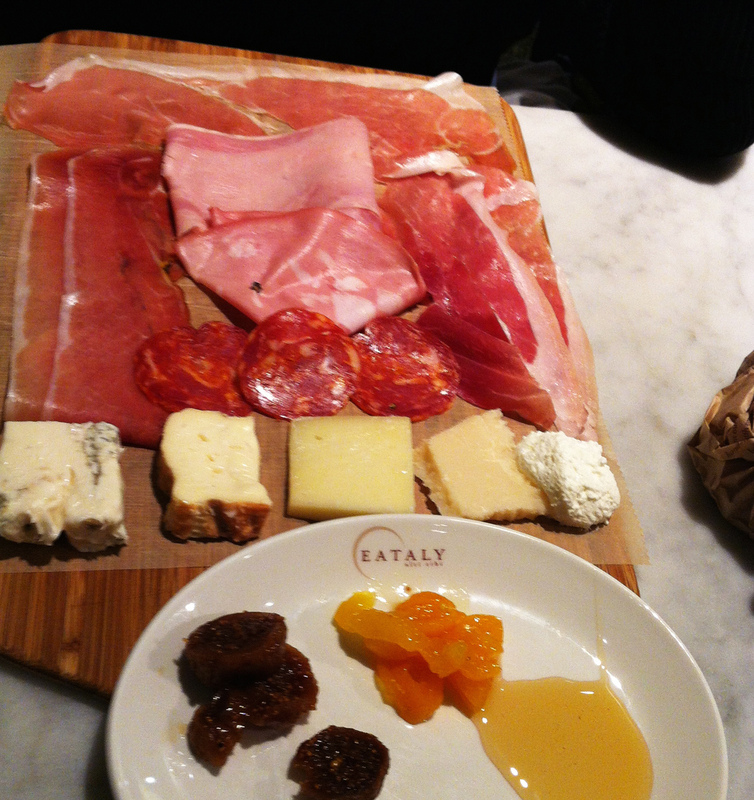 I had discovered Eataly 2 years ago when travelling with my husband. This trip with my best girlfriend required us to find accomodation about one and a half blocks away. So…..for 2 weeks we began our day with decent coffee and continurd with occasional lunches and regular dinners. best decision ever. You are so right! This place is a must when visiting NYC!! And ….by the way, the cooking class was fun, and of course, I can’t wait to try the recipes at home. Buon appetito! Brava Eataly! Thank you Gabrielle!……by the way…. Have you tried The River Cafe at Brooklyn…..near DUMBO? Fantastic!!!!! Fantastic! What a delicious coincidence and shows great minds think alike. I love the sound of the cooking classes – and will definitely have a look at The River Cafe. I think I may have been there ages ago – there is a lurking memory of a self-saucing chocolate pudding that I really must go back and verify… Buon appetite to you too Jenny & thanks for sharing the moment.